Description: The March JSUG will be on Fusion CRM with international speaker James Penfold. James Penfold is Oracle’s Senior Director of CRM Product Management and Product Development for Europe, Middle East and Africa. James has worked for over 15 years in the software industry focused on the delivery of enterprise applications and has held a variety of Development, Technical Architect and Product Management roles. James joined Oracle from salesforce.com where he was instrumental in building the AppExchange marketplace in EMEA and helping ISV’s develop, and deliver, commercial applications on the Force.com platform. 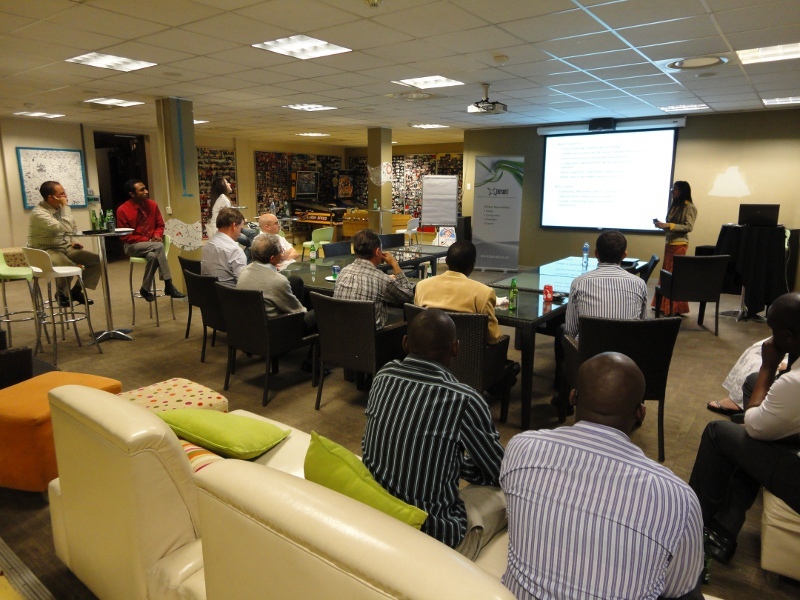 The September JSUG session saw Varsha Indurjith from Tetrad IT comparing Sales Force with Siebel. Varsha has development experience with both these platforms, so was able to give us a balanced view of the strengths and weaknesses of each. No sales talk! As Siebel professionals in the CRM industry, we need to know of the competing products. You cannot in good conscience recommend Siebel unless you understand where it fits in the CRM landscape. The only way to get a balanced perspective is to hear from people who have experience with a particular product. This session provided just that with respect to Sales Force. Varsha is a great speaker with vast subject matter knowledge. It was a pleasure to hear her speak and the attendees took full advantage of her knowledge in the Q&A session. Don’t forget next month’s session on Exadata! Thanks to Tetrad IT for sponsoring the evening. This is not a sales pitch! Bill has experience with Exadata and you’ll get the views of someone who’s had to implement this technology in the real world. Oracle is sponsoring a book giveaway! “Achieving Extreme Performance with Oracle Exadata”. Bring a guest to the evening and get an extra chance to win. 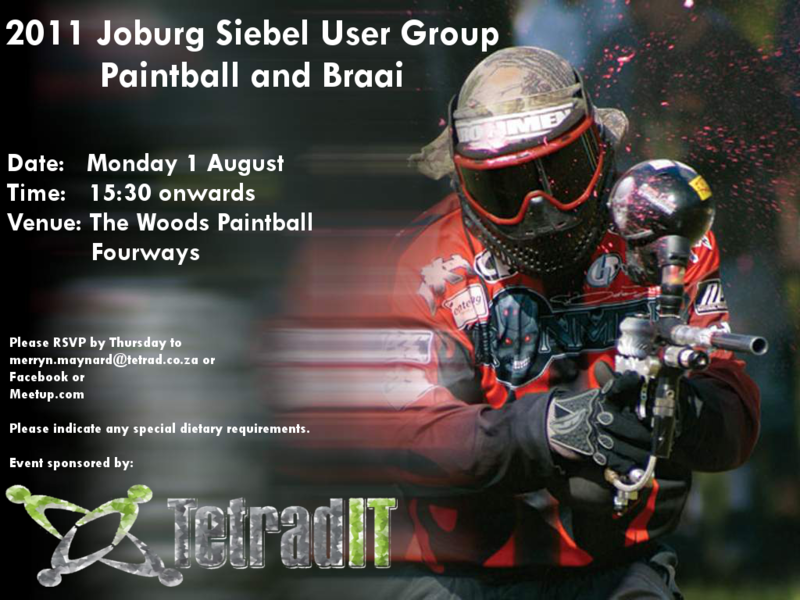 Please join us on Monday 1 August for the annual Johannesburg Siebel User Group social event. We’ll be enjoying some paintball followed by a braai. Even if you’re not into paintball, come along for the good food and company! Sponsors for the event are Tetrad IT. 8Km’s North of fourways mall, on William Nicol. Between the Jukskei and Diepsloot Rivers, across from Verwey driving range, you will find the River Sands farm, and entrance to the paintball range. From Pretora/Krugersdrop, take the Sandton/Diepsloot turnoff from the N14 Krugersdorp Highway, travel towards Sandton for approx 4km, and find the River Sands Farm and entrance to the Woods paintball on your left. 25 Deg 58 min 10 sec South, 28 Deg 1 min 3 sec East.